With MOTOTRBO Operations Critical Wireless accessories, you’ll find flexible, cost-effective Bluetooth solutions that give your people more freedom in their communications and more mobility in their work day. So they can move without wires, converse discreetly and even take their radio off their belt whenever the job requires it. This earpiece uses Bluetooth 2.1 Secure Simple Pairing, so it automatically pairs when you turn on the radio and earpiece. 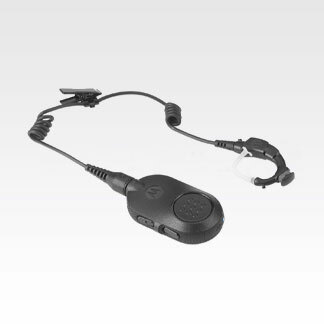 This earpiece is lightweight, comfortable, and durable enough to support your busy work day. It provides exceptional audio in loud environments and an extended battery life for long work shifts. MOTOTRBO XPR 6000 Series radios require a wireless adapter (PMLN5712).